Founded in 1889, the company has grown from one location in Pennsylvania to dozens throughout the U.S., Europe, and Asia. Our product line has expanded from one tool steel to hundreds of stainless steels and specialty alloys that help to meet the materials needs of a modern world. Carpenter Technology Corporation has two distinct operating segments; Specialty Alloys Operations and Performance Engineered Products. Carpenter&apos;s Specialty Alloys Operations (SAO) is the Company&apos;s major premium alloy and stainless steel manufacturing system. Facilities in the United States, Europe, and Asia provide customers cast/wrought and powder metallurgy stainless steels, high temperature (nickel, iron, and cobalt-base) superalloys, high-strength steels, implantable, magnetic and controlled expansion alloys, and tool and die steels in long product form. SAO also provides related services including contract manufacturing, conversion of customer-owned alloys, and the manufacture of custom parts and tooling components to your most exacting requirements. Carpenter&apos;s Performance Engineered Products includes differentiated operations of products and related services that include the manufacture of titanium alloys and metal powders, complex components for directional drilling equipment, and distribution businesses in the U.S., Canada, and Mexico. Amega West Services is a manufacturer and service provider of complex machined components for drilling, exploration, completions and production equipment. 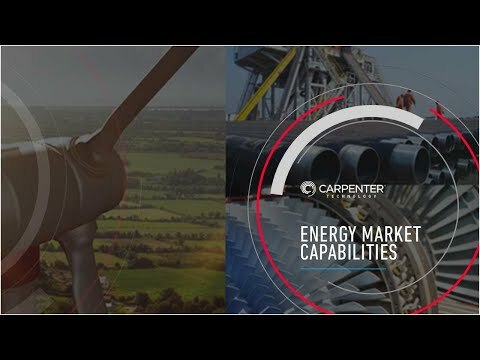 The acquisition has expanded Carpenter&apos;s portfolio of target applications in the oil and gas market. Amega West provides sales, rentals and repair services throughout 11 locations in the United States, Canada, Singapore and the United Arab Emirates. Carpenter Powder Products (CPP) is one of the world&apos;s most versatile producers of specialty alloys in the form of gas atomized spherical loose powders and consolidated powder metallurgy products. With a state-of-the-art powder metallurgy research and development facility, Carpenter Powder Products leads the way as a powder supplier for metal injection molding and hot isostatic pressing processes. Dynamet Incorporated is a leading domestic and international supplier of titanium alloy products for the aerospace, medical, consumer products, motorsports, and recreation equipment industries. Its wire, bar, fine wire, strip and shaped products have been used for applications requiring superior corrosion resistance, light weight, strength, and biocompatibility. Carpenter Distribution Businesses provide a broad range of stainless, specialty and tool steels from several facilities in North and South America.